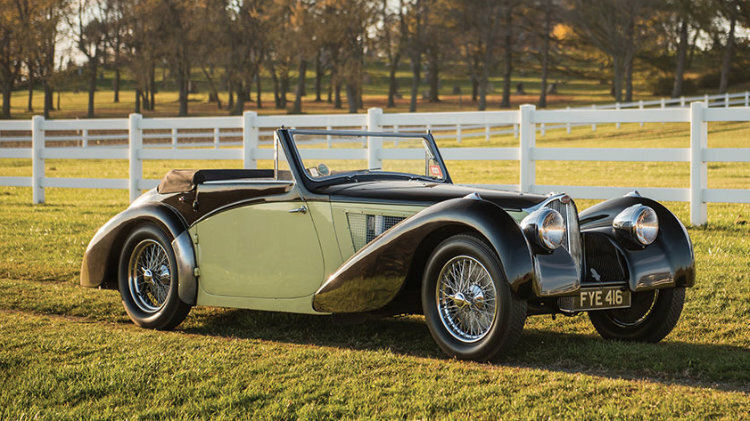 A 1937 Bugatti Type 57S Cabriolet with coachwork by Vanvooren is the lead car announced for the 2017 RM Sotheby’s Amelia Island classic car auction. Additional highlights from the elegant 1930s include a 1930 Stutz Model M Supercharged Coupe and 1933 Cadillac V-16 All-Weather Phaeton. RM Sotheby’s, the official auction house of the Amelia Island Concours d’Elegance, will return for the 19th year to Amelia Island, Florida, for a classic car sale on 10 and 11 March 2017. In contrast to previous years, a second sales day has been added to the auction during which nearly 60 cars from the Orin Smith collection will be sold. Around 80 cars will be on offer in the regular auction. A stunning 1937 Bugatti Type 57S Cabriolet, estimate in excess of $8.5 million, chassis no. 57513, with rare coachwork by Vanvooren of Paris is the headline car for the RM Sotheby’s 2017 Amelia Island sale. Offered for public sale for the first time in its 80-year history, the Type 57S is expected to be among the most valuable automobiles ever offered during the Amelia weekend. In 2016, Bonhams sold a 1937 Bugatti 57 SC Sports Tourer for $9,735,000 while the marque record (in nominal terms) was set by Gooding at Pebble Beach 2016 at $10,400,000 for a 1932 Bugatti Type 55 Roadster. The Amelia Island record is $17,160,000 set by a 1961 Ferrari 250 GT SWB California Spider sold by Gooding & Co at Amelia Island 2016. In 1962, the featured T57S was acquired by T.A. (Bob) Roberts, OBE, who went on to become its longest-term owner, carefully maintaining the car for the next three decades. Early in Roberts’ custodianship, the Bugatti was changed to its current livery of black over primrose yellow, with various upgrades made to enhance cooling and lighting. During the 1970s, Roberts fitted 57513 with an unused 1937 Type 57G competition engine, while the original unit (numbered 21S) was kept along with the car. Thereafter, it was principally used as a road car, and eventually retired to Roberts’ Midlands Motoring Museum in Bridgnorth, Shropshire, with its original engine reinstalled before passing onto its current and first American owner in the 1990s. In single-ownership for the last two decades, 57513 comes to Amelia Island with its original engine still equipped with the larger competition carburetor from the Type 57G motor, offering an impressive increase in power, and following a recent mechanical recommissioning by RM Auto Restoration. It is expected to command in excess of $8.5 million when it takes center stage at RM’s Amelia Island sale at the Ritz-Carlton in March. One of only three supercharged Stutzes in existence, the 1930 Stutz Model M Supercharged Coupe, chassis no. M-C-31312, is clothed as a rakish and low-slung aluminum coupe by Lancefield Coachworks. Universally lauded for its handsome and sinister appearance, it comes to Amelia Island beautifully restored and with an impeccable history, including a well-known roster of owners dating back to famed Stutz collector A.K. Miller, who purchased it in the late 1940s. Owing to its provenance, design and supercharged specification, it is undoubtedly one of the most desirable examples of the Stutz marque (Est. $1,000,000 – $1,400,000). The 1933 Cadillac V-16 All-Weather Phaeton, motor no. 5000102, is a fantastic example of the top-of-the-line Cadillac V-16 of its era. For the first time in 1933, Cadillac gave the V-16s a separate identity with unique styling cues found in the body lines, fender edges and various finish details throughout. It was also the first Cadillac to feature the “de Sakhnoffsky” hood— a striking feature in which the hood overlaid the cowl and reached to the base of the windshield. With the Depression taking its toll on the upper classes, only 126 V-16s were delivered by Cadillac in 1933. Only a small number of these All-Weather Phaetons from this rare year are known to survive. Elegant and sporty, the featured example is very well-known and respected in collector circles. It boasts prominent ownership history, including Gifford Oborne, Bill Chorkey, Carmine Zeccardi and, more recently, Steve Plunkett in whose collection it resided for over a decade (Est. $400,000 – $500,000). Other early highlights already announced for the RM Sotheby’s Amelia Island 2017 auction include a 1961 Ferrari 250 GT SWB Berlinetta and the Orin Smith Collection.